Healthy, raw, and naked foods that is. There are three similar books on my review pile so I decided to write about them all at once. I will also be giving these books away! The publishers gave the books to me and it makes me happy to spread the love. Before Friday April 13th, leave a comment telling me which book or books, you would like. At noon of that day I will do three random drawings and post the winners. 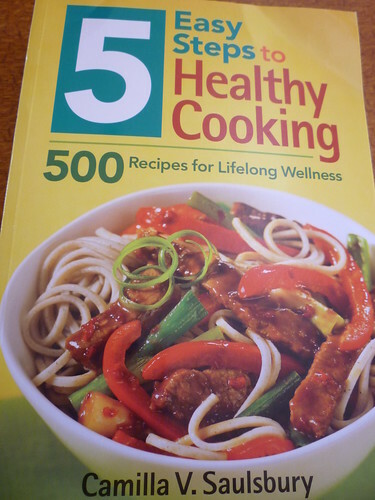 First up is 5 Easy Steps To Healthy Cooking: 500 Recipes For Lifelong Wellness by Camilla Saulsbury. The five steps are ones you have heard before, such as eating a plant based diet, using whole grains, and good fats. The author begins with her "5 steps" and some brief nutritional information. The bulk of this book is made up of the recipes. Over 500 pages of recipes. There is nothing unfamiliar about the food, but the recipes do offer ways to change things up just a bit to make the meals you may already be cooking more healthful. Things like swapping out regular pasta for whole wheat, or using honey instead of processed sugars, as well as why the changes are for the better. Every recipe is accompanied by cooking tips, storage tips, and a nutrition analysis. A good choice if you're looking to eat healthier, but not ready to stray too far from your favorite foods. 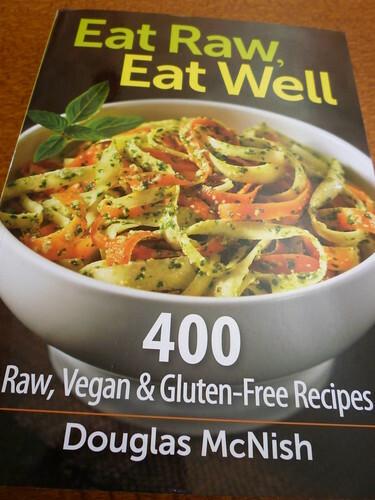 Next we have Eat Raw, Eat Well: 400 Raw, Vegan & Gluten-Free Recipes by Douglas McNish. The raw food diet has been around for a number of years now, so there must be something to it. The book begins with just a few pages about raw food diets and techniques. I was surprised to learn that dehydrated counts as raw. The recipes are quite varied. You can find both Mexican Tortilla Soup and Lo Mein "Stir Fry". In addition to main courses there are lots of soups, salads, dips, and sauces. Many ingredients are familiar, just not prepared in a traditional style. Tomato Basil Marinara Sauce contains the tomatoes, garlic, and basil you would expect, but instead of having the sauce bubble away on the back burner all day, it is put in the food processor and eaten as is. After reading the book I have found myself looking at foods in a new way. "Because we always do it that way" can leave us in a rut. This book will have you veering off the trail and seeing things in a whole new light. Last but not least, The Naked Foods Cookbook: The Whole-Foods, Healthy-Fats, Gluten-Free Guide to Losing Weight & Feeling Great by Margaret Floyd and James Barry. "Eating naked is all about eating clean, whole, unprocessed food." In this book you can find meals from breakfast to dessert using simple ingredients and techniques. One of the bonuses to eating naked is pared down preparations. The book even includes a few dishes that require fermenting or culturing. If you ready to dip your toe in the wacky world of fermenting, this might be a good place to start. The copy of this book that I am giving away is an uncorrected galley, which means there is no index or page numbers and there may be typos. Read the directions to be certain the amounts and preparation make sense and you will be fine. Three books to help you begin or continue to eat well. Leave a comment letting me know which book, or books you would like to win and I will announce the winners Friday. I like the first one, mostly because I know it would get the most use in our family. 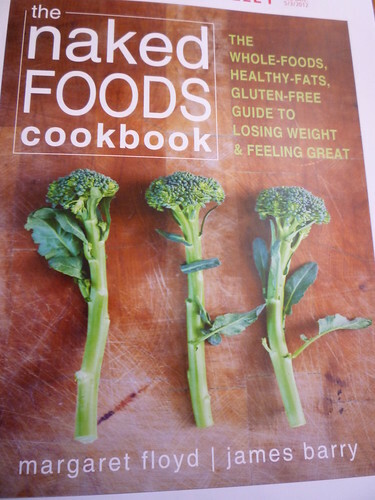 We aren't looking to make radical changes, but sometimes a nice new recipe book shakes up the routine meals, you know? I think all 3 books are great but I would be interested in either book 2 or 3. Hey interesting books, i want to buy # 3 how can I buy send me link please. These books look pretty promising and interesting. I wanna buy all of them. Thanks! I like the second book. There are foods that are best eaten if raw because it can give more nutrients than cooked.